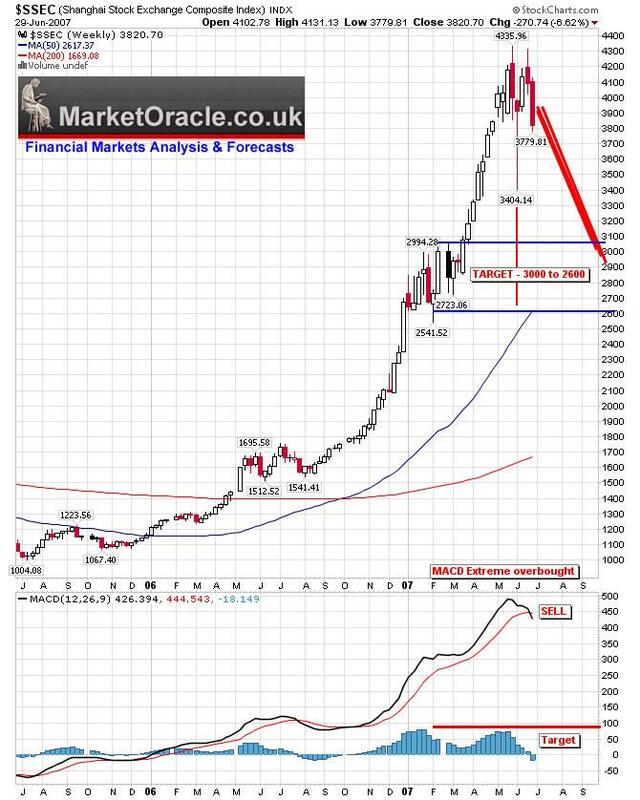 China Stock Market Crash, A Buying Opportunity? a. The parabolic up move to the peak in May 07 at 4335.
c. The wide measuring move between the two peaks of 765.
d. The support zone between 3050 and 2600.
e. The MACD indicator is in a critical overbought state, also a MACD cross has occurred which confirms the downtrend. The market has been bid up to an expensive state and currently trades on a PE ratio of 45. This is especially apparent when compared with other fast growth markets such as India on a PE of 22 and South Korea on 20. Which highlights the extreme overbought state of the chinese stock market. Conclusion : The Shanghai Index is targeting a downtrend to between 3000 and 2600. Given the rapid rise to 4335 this is likely to be over a short period of time, possibly to be completed by Sept 07. The fall from the 4335 would represent at least a drop of 33% in the chinease index. Even though many chinease investors will be hurt to some degree by the fall and there will be some limited impact on the chinease economy. The decline will still represent an good long-term buying opportunity given that China's growth rate is currently running at 10%, even if it takes the market some time to build a base before resuming the bull market. This bull market has many years if not decades further to run so there is plenty of time for short-term overbought states to work themselves out for long-term investors. There will be some fallout in other stock markets, but it seems that the financial markets have learned from the February falls to 'expect' a downturn in the China given the relatively expensive pricing of China's shares. Therefore the sell offs in other markets are likely to be relatively muted in comparison, especially in markets that are in a technically much better shape, such as Japan. The chineese economy has been rising in conjunction with the growing markets and with the growing export surplus. The market will hurt the economy and consumer spending down in the united states will hurt there export surplus, a bit but they do have emerging markets to sell to, but these markets will likely be impacted by the domino effect of the chinese market taking the DOW down along with derivatives repricing, and then emerging markets will be hit .